Absolutely love these labels, they are so bright! This makes it easily visible for the teacher and my toddler. There are clear instructions on how to apply the Labels so they stay on. The shapes and sizes of these labels are so convenient! The Tiny Clothing Labels were exactly as described. The instructions were very easy to follow and delivery was so quick! Excellent quality and a great variety of label sizes in this Essential Value Kit. Would definitely recommend to my friends! At Bright Star Kids, we love labels. Not only the functional kind that we sell, but the descriptive ones that our customers give us: reliable, convenient, affordable, & adorable! 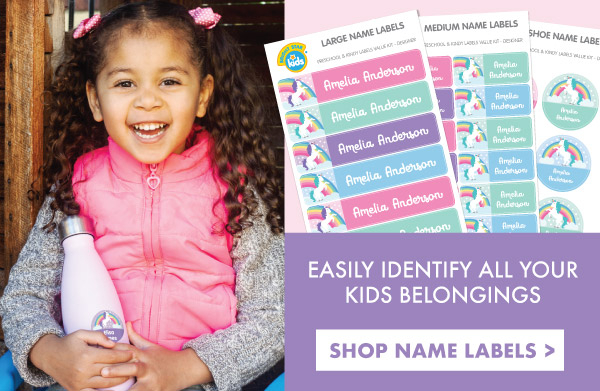 What stemmed from a basic need to help parents with common organization, has evolved into a wide assortment of personalized name labels that both adults & kids love. Our mission is simple: to provide high quality name stickers & clothing labels in a variety of styles to suit boys & girls of all ages. Designed with the utmost attention to detail & quality checkpoints, our labels promise to stand the test of time against the active lifestyles of families around the world.